Like many of London’s oldest questions, this depends on what you mean – the oldest site of worship, the oldest continuous site of worship, or the oldest building are but a few possibilities. 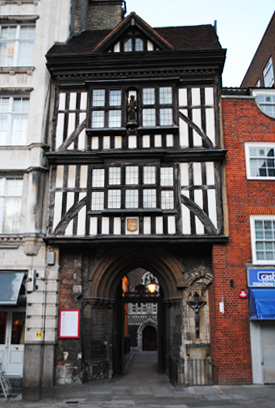 For our purposes, it’s generally accepted that London’s oldest surviving parish church is St Bartholomew the Great in West Smithfield. This atmospheric church is now only half the size of what it once was but that part which remains – the original quire, altar, side aisles and lady chapel – was founded in 1123 AD as the priory church for a community of Augustinian Canons. The church owes its origins to Rahere, a favored courtier of King Henry I, who after the death of King Henry’s wife Queen Matilda and then heir, Prince William, along with some other family members, renounced his way of life and decided to make a pilgrimage to Rome. In Rome, he sickened, and fearful for his life, vowed to found a hospital for the poor on his return to London. Subsequently recovering, he was about to head home when a vision of St Bartholomew appeared to him and told him that he had helped him to recover and now desired him to found a church in Smithfield. On his return to London, Rahere did just that – founding the priory with its church and a hospital for the poor. He died 1145. Amazingly, his tomb still lies within the church, on the left hand side of the altar. The priory grew in importance with income coming not only from offerings and rents but from tolls at St Bartholomew’s Fair which was held on grounds to the north of the the church (as an interesting aside, it’s also known that the church had a low wall built in front of its western facade to separate it from Smithfield. Known as the Cheyne, this could be closed with a chain on market days to stop cattle wandering inside). The church’s current configuration came about in the Great Dissolution – the priory was dissolved in 1539 and the nave of the church was pulled down, leaving the quire, altar and lady chapel. The church was briefly used by some Dominican friars but since the reign of Queen Elizabeth I has fulfilled the role of parish church. A concerted restoration effort began in the mid-19th century. Livery companies associated with the church include The Butchers’ Company which still hold a special service here in September prior to electing a new Master. These days, St Bartholomew the Great is a welcome refuge from the hustle and bustle of the City and still gives a strong sense of the life it has known.